After an impressive win against Colombia’s Santiago Giraldo, Aussie tennis rising star Nick Kyrgios couldn’t keep things together against former Wimbledon champ Andy Murray. 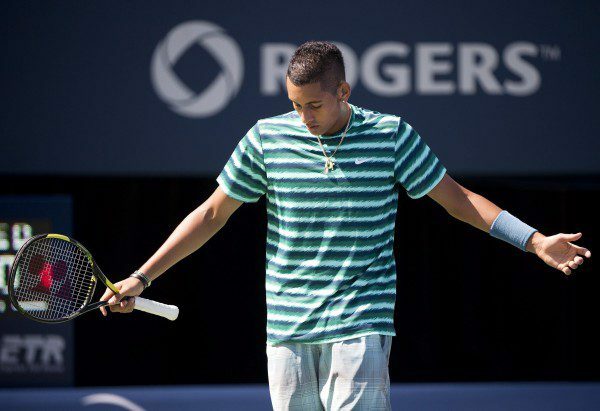 Competing at the Toronto Masters, Kyrgios only progressed to the second round where he met Murray, conceding a 6-2, 6-2 score in less than an hour. Andy Murray made light work of the promising Aussie teenager. who just a month before made it to the quarter final of Wimbledon. Murray ended with four breaks of Kyrgios and was never in danger on his serve. The Scot served seven aces and 14 winners in his brief outing. The ninth seed, who won the Canadian title in 2009 and 2010, had been seen as a potential scalp for the dangerous Kyrgios since losing to Bulgarian Grigor Dimitrov in the Wimbledon quarter-finals. In the interim, the disappointed 27-year-old Scot left for his training base in Miami to try and rediscover his best form and has not competed on the ATP tour for more than a month. “I was just lacking a little bit. But after Wimbledon, I went over to Miami and I really trained like I used to for the first time since the surgery and I felt much better,” said Murray. Murray showed in Toronto that his work was starting to pay off, as he hammered Kyrgios, who upset Rafael Nadal in the fourth round at Wimbledon. “I thought I did most things pretty solidly,” said Murray. “I didn’t make too many errors. I moved well, I had a high first serve percentage. Kyrgios had never played Murray before and said before the match that “it’s going to be one of the toughest matches I have ever played”. The 19-year-old half-Greek, half-Malaysian star has seen a rapid interest in his ability from the world’s best after getting the best of Nadal. He caught the eye of world number one Novak Djokovic recently after the two met for a practise session at the start of the tournament. ” Good hit today bro … U were firing those serves well! Save some power for tourney (tournament)” Djokovic posted on his Twitter account. Kyrgios replied: “Thanks mate! Good luck, always a pleasure, I think the crowd were going for me” which Djokovic conceded, “I think so too … well,they loved you even more when you gave kids your racket. Good staff [sic]”. Kyrgios’ friend and fellow Greek Australian Thanasi Kokkinakis suffered an opening-round defeat to South Africa’s Kevin Anderson, going down 4-6 6-2 6-3 in Toronto. Kokkinakis joined compatriot Bernard Tomic after they won their final-round qualifying matches to advance to the main draw, but Kokkinakis fell in three sets to cut his ATP conquest short. The 18-year-old admitted this week that the recent success of his friend Kyrgios has motivated him and made him believe that he is not too far from his own breakthrough on the ATP Tour. Kokkinakis admitted there is still hope for him to reach his friend’s success, even if there’s a bit of jealously there.